“If you’ve seen one rural town, you’ve seen one rural town" (Schwartz, 2012). This quote from the National Association of Development Organizations illustrates how unique rural communities can be when it comes to their varied histories, geographies, natural resources, and demographics. Such an array of assets within rural communities highlights the importance of bringing together a range of representatives from social, economic, and environmental perspectives when planning and implementing rural development initiatives. Although rural areas are diverse and unique, the gap between prosperous urban and distressed rural areas continues to widen (Economic Innovation Group, 2017). To combat this widening gap and preserve valuable resources, some rural communities have brought together different stakeholders, including organizations, businesses, government representatives, and local residents, to build a plan for action based on a community-wide understanding of issues and opportunities. Stakeholders are individuals who are affected or could potentially be affected by a decision or circumstance (Ramirez, 1999). 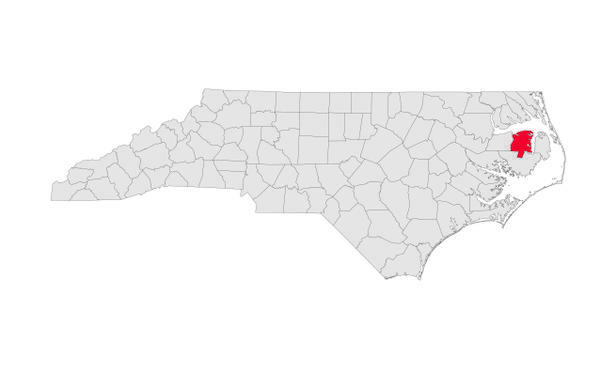 Examples of this inclusive process include Tyrrell County, North Carolina, and Fairfield, Iowa, where groups of concerned individuals and organizations came together to work towards shared goals and ultimately more economically prosperous communities. These collaborative efforts seem like a great idea on the surface, but it is challenging to achieve the desired community improvements. To explore the concept more deeply, it is necessary to unpack three key considerations that can increase the likelihood of success: coming together, staying together, and growing together. In this handbook, we expand on these components for successful rural revitalization collaborations and provide examples of their use in practice. 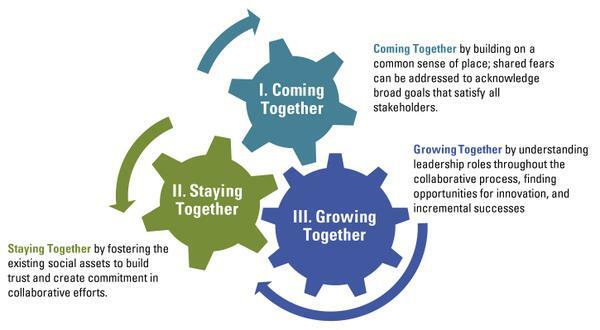 The three components for successful collaborations—coming together, staying together, and growing together— create a social mechanism for stakeholders to collaborate towards a common goal (Figure 1). Figure 1. Three key components to successful collaboration for rural revitalization. Stakeholders build common ground in several ways. Primarily, common ground is built through connection or relationship to a place or geographic location (Mikalsen and Jentoft, 2001). Connections to a particular place or places can bring community members and groups together. These places and spaces where partners feel comfortable and have a positive social experience create an environment essential for successful collaboration (Wondolleck and Yaffee, 2000). Specific neighborhoods, communities, or locations are the foundations that bring partners together to collaborate. Places are powerful symbols that bring a community together (Caffyn, 2000). A “sense of place” can help promote collaboration. Beyond physical location, a “sense of place” can refer to community identity, attachment to a place, participation in community events, or a combination of these factors (Mikalsen and Jentoft, 2001). Additionally, attachment to a place can be associated with emotional connection and feelings toward community, known as “a sense of community.” That connection can foster trust and citizen participation in a community (Manso and Perkins, 2006). Rural communities are powerful places because sense of community is often very strong (McGehee, Kline, and Knollenberg, 2014). In Tyrrell County, North Carolina, a strong sense of place was revealed when community members expressed a connection with their local heritage, culture, natural resources, and relationships, which are particularly important in rural areas. For more information on this partnership, see Exhibit 1 (Peroff et al., 2017). Similarly, in Canada’s Waterloo and Wellington Counties, various breweries and local businesses collaborated to share the art of craft brewing and its cultural significance to the community. Based on this, the “Ale Trail” launched, attracting tourists to the region and stirring economic development (Plummer, Tefler, and Hashimoto, 2006). Without the identification of the locals’ passions and a common objective to create a local brewing culture and economic growth, the relationship between the breweries and community members may not have formed. Tyrrell County is the least populated county in the entire state and one of the most economically distressed. About 85 percent of the county is composed of wetlands, much of which is managed by the U.S. Fish & Wildlife Service. Tyrrell County is also rich in cultural and ethnic diversity and has a long history of fishing, farming, and forestry. In 2000, government agencies, municipalities, nonprofits, local businesses, and other local community groups decided to formalize ecotourism as an avenue for economic development. The goal of this partnership, the Tyrrell County Ecotourism Committee (TCEC), was to “promote and protect the county’s natural resources through tourism, in a manner that benefits the local economy and pays tribute to the region’s rich cultural heritage.” The partners hoped to promote a variety of ecotourism activities by creating products such as maps and brochures. The partnership was active from 2000 to 2009. During that time, 29 different organizations and 66 individuals participated at varying levels and during different time periods (Peroff et al, 2017). Stakeholders collaborate when individuals or groups share a problem or a common goal, or both (Wondolleck and Yaffee, 2000). Three phases are particularly important to engage multiple stakeholders in collaboration: defining the problem, analyzing constraints and opportunities, and agreeing on an action plan (Figure 2). For example, local members in a historic lead mine operation in North Pennines, United Kingdom, joined together with the goal of improving the management of their area. The shared problems that triggered the collaboration of the North Pennines Tourism Partnership (NPTP) included a lack of an economic driver and poor management of the area’s natural resources and watersheds. This effort led to three counties and six council districts working towards their shared goal of sustainably managing the unique and pristine region. Together they created an action plan to develop a sustainable tourism initiative (Caffyn, 2000). Successful collaboration focuses on superordinate, or long-term, goals of the engaged stakeholders while pushing aside their differences and varying backgrounds to look at what they have in common. This long-term goal must be defined early in the effort and revisited periodically. Doing so, stakeholders can (re)focus their attention to the overall mission and shared goal of the collaboration. Establishing a common vision and mission helps imagine a solution to the shared problem and creates a sense of accomplishment that builds relationships (Wondolleck and Yaffee, 2000). Engaging stakeholders in the process of coming together for rural revitalization may seem straightforward: identify those who are interested in solving the problem or creating new opportunities and invite them to the discussion table. However, conveners will likely need to put forth additional effort to identify all potential stakeholders and increase the opportunity to participate for commonly excluded community members. For further information about engaging stakeholders, see Exhibit 2. Diverse communities might face additional challenges in building trust to achieve inclusion and participation of commonly excluded perspectives. Including stakeholders early in the process and engaging them throughout the process ensures that conveners of collaborative efforts will learn more about the public’s values and needs. In turn, the public gains insight into the complexity of the current issues and opportunities. 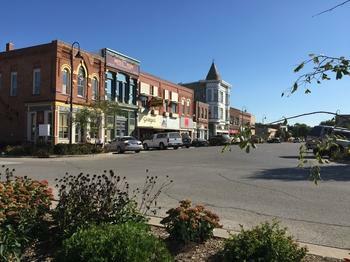 A case study on the revitalization of small town Helena-West Helena, Arkansas, demonstrates the power of an inclusive planning and implementation process. In an effort to coordinate economic development, housing, education, leadership development, and health care efforts to address the town “hitting rock bottom,” the community created the Delta Bridge project. Integrating local development efforts with state, regional, and national programs, a strategic plan was created to serve as a blueprint for Delta Bridge (Lambe, 2008). This project established backing from a well-known and respected funder and engaged a broad cross section of the public at the outset. The process included checks that ensured different perspectives were being accounted for during every decision and provided opportunities for people to join in on the process as they saw fit. This inclusive and collaborative process minimized the potential for community resistance and barriers. Success in collaboration can be credited to processes such as the development of marketing materials. However, the relationships among community members are just-as-important criteria for success (Peroff et al., 2017). Figure 2. Three phases to engage multiple stakeholders in collaboration. Collaboration can help achieve outcomes that might otherwise be impossible. To do so, collaboration requires effort to nurture human relationships. People represent organizations, agencies, or occupations, but they are fundamentally human beings. Relationships are built between individuals, not organizations. Therefore, developing understanding, empathy, trust, and motivation among individuals can foster collaboration among organizations. These relationships are necessary to create a shared vision and promote commitment to collaborative goals (Wondolleck and Yaffee, 2000). For successful collaboration, it is important to devote time to communication and outreach. Offering opportunities for joint action and interaction can jump-start collaborative processes. These activities also build social assets. Social assets reflect connections between people and organizations and are the “social glue” that makes things happen. Building social assets also entails networking or strengthening social networks. Fostering social assets requires responsibility and ongoing commitment by all stakeholders. Good communication is a key factor for establishing and maintaining commitment. Social interaction creates opportunities to foster trust and develop effective channels of communication. Fortunately, rural communities are often rich in social connections and opportunities for interaction. Collaborative success appears to be case-dependent and is determined based on a variety of outcomes. However, social assets are common across a diverse array of successful collaborations (Ramirez, 1999; Manzo and Perkins, 2006; Mountjoy et al., 2013). The steps to create and nurture social assets are displayed in Figure 3. Collaborative work requires trust, which is often associated with familiarity and working closely together. Research has shown there is often a lack of trust in rural development activities, particularly between state and nonstate (such as entrepreneurs, philanthropists) actors, among competing sectors, or among different community subgroups, such as racial or ethnic minority groups. This lack of trust is most often due to imbalances in power and incentives to collaborate. Trust is built when power is equally shared between participants (Johnston, 2015) and when community members feel their voices are heard (Marquart-Pyatt and Petrzelka, 2008). There is no magic recipe for establishing trust, but successful rural revitalization initiatives should devote time to building trust in the community. Meaningful interactions build trust. Partners need to feel their ideas and perspectives can be both shared and challenged without fear of repercussions. When convening diverse stakeholders, it is important to encourage honest and respectful feedback using established ground rules. Rural communities often exist as small and tight-knit entities, presenting relational opportunities on which to build trust and enhance the longevity of collaborative efforts (McGehee, Kline, and Knollenberg, 2014). Collaboration operates temporarily and exists as a complex life cycle with different stages of development (Economic Innovation Group, 2017). Although temporary by nature, collaboration should exist long enough to achieve the shared goals determined at the outset. Yet, to reach those goals, participants need to be committed to the process and tasks, as well as the pooling of resources. Free exchange of information ensures collaborators understand each other and can build on common ground to move forward from what brought them together initially. Consensus can be reached when each contributor is an active and accountable actor. Effective communication ensures responsibility, accountability, and commitment (Wondolleck and Yaffee, 2000). Maintaining collective ownership can lead to a greater commitment by those involved and encourage them to work towards shared goals (Peroff et al., 2017). Trust is built when partners maintain commitment, uphold responsibilities, and partake in reciprocity. Over time, these actions create “trust-based” relationships that allow for security and longevity within collaborations (Saxena, 2005, p. 284). The possibility for new and innovative opportunities increases when relationships are formed and maintained through demonstrated trust and commitment (Wondolleck and Yaffee, 2000). The advantage of collaboration over single actor efforts is the possibility of partnership synergy, or “the power to combine the perspectives, resources, and skills of a group of people and organizations” (Lasker, Weiss, and Miller, 2001, p.183). With a foundation of healthy communication among partners, collaborations can break new ground, challenge accepted wisdom, and discover innovative solutions to problems. The new and innovative procedures create opportunity, which results in enduring collaborations (Saxena, 2005). Figure 3. Nurturing social assets steps, outcomes, and examples (Wondolleck and Yaffee, 2000). Often collaboration evolves when “the way it’s always been done” no longer works. Collaborative efforts require strong leaders to leverage community capacity, make connections, and take the first steps. 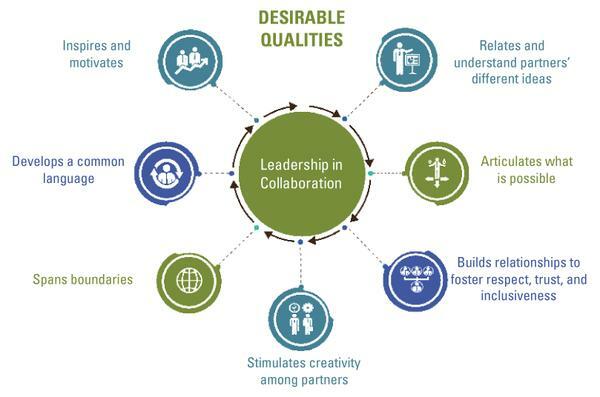 In this section, we introduce concepts related to leadership (for desirable qualities of leaders, see Figure 4) and the need for proactive and entrepreneurial approaches when collaborating. Collaborations need a strong leader whose “energy and vision mobilize others to participate” (Selin and Chavez, 1995, p. 191). These leaders are the people who put in work beyond the minimum requirements and have the wherewithal to wake up early and stay up late to motivate others. Collaborators across all sectors have noted a need for key individuals who foster networks and encourage collaboration (Dow et al., 2013). This cross-sectoral agreement about the value of leadership is especially salient in the rural revitalization context, as rural communities have great potential for collaboration across multiple sectors. The following subsections highlight the need for local leaders and transitions in leadership, as well as the need to plan and understand the time when collaboration is no longer necessary. Leaders can be formal or informal, but they should be local. In the example of the Tyrrell County Ecotourism Committee, the initiating organization was not from Tyrrell County. This organization provided the initial leadership for the committee, but leadership was never transitioned to a local champion, neither an organization nor an individual, when the convener left the partnership. Without a local leader, the partnership phased into decline (Peroff et al., 2017). Outside groups initiating a collaboration and taking on leader status can result in dependency rather than responsibility among local partners (Caffyn, 2000). Thus, local leadership is especially important for collaborations with a place-based focus, such as in rural revitalization. Changing leadership is not necessarily problematic in collaborations. In fact, leadership needs change over time, as individual leaders can only sustain the energy required to maintain commitment and inspire innovation for so long. In the early stages of collaboration, a dedicated leader with strong connections throughout the community encourages collaboration and is necessary to bring in stakeholders. These local champions can prioritize and coordinate a network of human, financial, and other resources to provide the spark for collective action (Sandstrom and Carlsson, 2008). A change from this highly centralized leadership structure should occur over time. Collaborative efforts initially require a strong leader to rally their network, but leadership needs change once the proper groundwork has been set. After creating a shared vision and cultivating commitment among participants, transition becomes easier, and there is an impetus to continue the collaborative efforts when a convening leader leaves. Established efforts require less centralized leadership and more management of the connections between the various subcommittees or other groups that develop from collaboration. 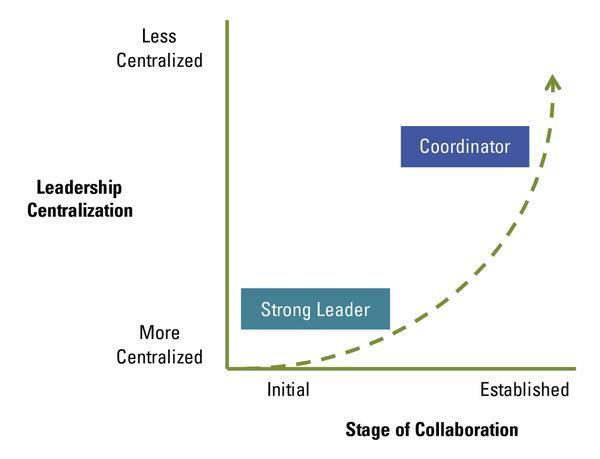 For a visualization of how leadership centralization changes over time, see Figure 5. Turnover is natural and important in collaborations. As discussed earlier, leaders need to lead differently at different times. Many leaders also cannot sustain the leadership lifestyle for an extended period or they will burn out, while others need to continually move on to new projects as they are invigorated by the early stages of collaboration. It is important to discuss turnover early in the process to normalize transitions. Emerging leaders can then be identified and trained, fostering leadership capacity and seamless transition in a collaboration. Collaborative relationships are not intended to be permanent; however, a planned and positive ending is better than simply drifting apart due to lack of coordination (Dow et al., 2013). The ending of a collaborative effort does not necessarily mean all efforts cease to exist and outcomes are halted. Instead, efforts originating from the collaborative process could continue with a new or already existing collaboration. Likewise, specific components of the collaboration could be absorbed by a specific stakeholder that has strong ties to seeing it through. Even during the ending of a collaborative effort, remember to nurture social assets (Figure 3) by communicating and celebrating where the collaboration is and where it is going next. Collaboration often requires trying something new. In the subsections below, we provide an overview of how new ideas flow through a community and ways in which collaborative efforts can make the most of existing programs and networks to achieve their goals. A proactive approach requires collaborators be forward-thinking and anticipate the needs of their communities, not simply react to an issue. It requires a willingness to take risks and innovate. Few individuals, however, are considered “innovators” (Rogers, 2003). The Diffusion of Innovation Theory, frequently studied in agricultural settings, suggests that only about 2.5 percent of a community are true innovators. A few more (13.5 percent) are “early adopters,” while most people (68 percent) want to see an idea work before they adopt it (Rogers, 2003). In the context of collaboration, innovators are the ideal leaders for rural revitalization, and early adopters are needed to help convince the “majority” that collaboration is worthwhile. Not all potential partners will be ready to jump at a new idea. Therefore, it is important for the innovators and early adopters in a community to leverage their entrepreneurial spirits and demonstrate the potential success of a collaborative effort. By demonstrating initial success, collaborators can appeal to other potential partners. For more information about the categories of adopters, see Exhibit 3 and Figure 6. Innovators want to be the first to try an innovation, are willing to take risks, and are often the first to develop new ideas. Appeal to them through informal conversation. Early Adopters represent leaders of opinion, enjoy leadership and embrace change, are aware of the need for change, and are comfortable adopting new ideas. Appeal to them with how-to manuals and information sheets on implementation. Early Majority are rarely leaders and adopt new ideas before the average person once they have evidence an innovation works. Appeal to them with success stories and evidence of effectiveness. Late Majority are skeptical of change and will only change once an innovation is commonly adopted. Appeal to them with information about how many people are involved and the benefits being received. Laggards are bound by tradition and very skeptical of change. Appeal to them with statistics, fear appeals, and pressure from people in the other adopter groups. To engage diverse stakeholders and segments of a community in rural revitalization efforts, collaborators should consider how to leverage small successes to demonstrate the effectiveness of a collaboration to the majority. While it may be enticing to jump right into the big issue, it is often more effective to take small steps and work on “easier” issues first. Small wins are important for building trust between partners and overall confidence in the collaborative relationship. In short, “nothing succeeds like success” (Wondolleck and Yaffee, 2000, p. 168). In rural communities, many people often already know and trust each other, making existing networks excellent springboards for exciting new ideas for revitalization. Networks encourage knowledge sharing and mobilization of key resources (Bodin and Crona, 2009). Use of community networks can be seen in Potosi, Wisconsin, where the town’s successes “are rooted in the people of the village who revived and re-branded an important part of their history, embraced historic preservation, and developed a unique business model” (Schwartz, 2012, p. 3). The community organization initiated to achieve their common goal continues to be run largely by volunteers throughout the community. 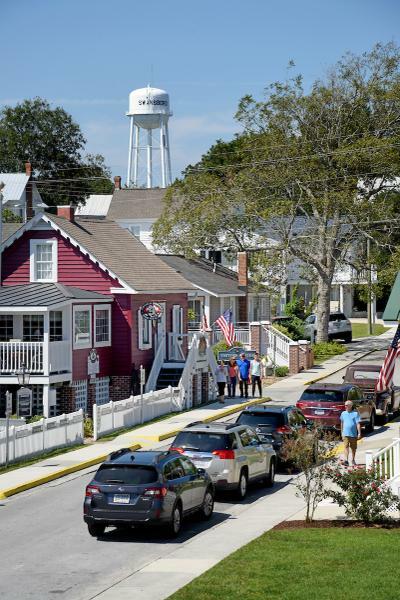 By using their existing networks, community members were able to leverage diverse funding sources to revive a unique historical landmark and create economic impact for their town. There is a certain amount of patience required in collaboration. Not every attempt to collaborate will succeed, and failure often offers valuable lessons for future collaborative endeavors. For an example of employing persistence and learning from failure, see Exhibit 4. After losing a college in the town, leaders in Fairfield, Iowa, felt the town had failed to maintain this important economic entity. 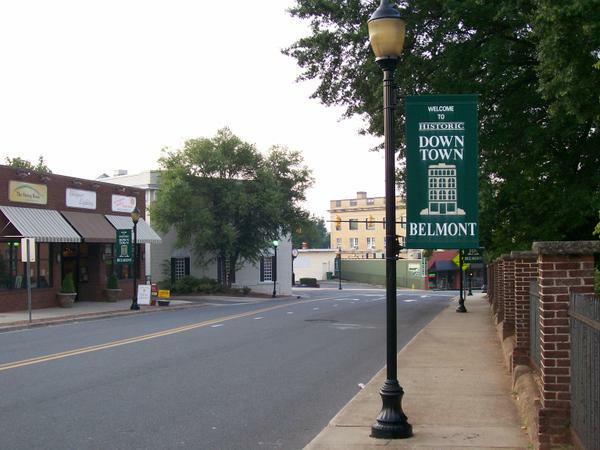 Instead of dwelling on defeat, leaders built off the town’s deep entrepreneurial roots. Refusing to fall into a “that’s how we’ve always done it” mindset allowed the town to take proactive and entrepreneurial approaches. The town sold the land formerly occupied by the college to another school and have developed a strategy to support entrepreneurship and the expansion of small business by creating networks of entrepreneurs. With a focus on new approaches and an acceptance of failure as a step on the road to success, Fairfield has created “a civic infrastructure that rivals that of large cities” (Lambe 2008, p. 175). When it is time to do something different than what has always been done, remember that strong local leadership is important to facilitate collective action. However, leadership needs may change over time. Leveraging the early adopters in the community will ease the potential pushback against change. Demonstrate small wins to build confidence and trust in the work. Use existing networks and programs to support new, innovative ideas, and learn from failure. Figure 4. Desirable leadership qualities for collaboration (Lasker, Weiss, and Miller, 2001). Figure 5. Leadership becomes less centralized as a collaboration continues. Figure 6. Proportion of innovation adopter types within a community (adapted from the Diffusion of Innovations Theory, Rogers, 2003). The growing disparity between urban and rural communities presents a unique challenge, and collaboration can transform this challenge into an opportunity. Collaboration provides advantages over a single person, organization, or sector working alone to achieve goals (Lasker, Weiss, and Miller, 2001). Motivated through a shared vision and positive incentives, people work together to mobilize a variety of resources, ideas, expertise, and support that can create success. In this handbook, we briefly present many facets of collaboration to guide and encourage not only coming together but also growing and staying together. These guidelines can be used to establish productive and enduring processes compatible with rural revitalization. Yet, it is crucial to note that no single answer to collaboration exists. Each collaboration will need its participants to set their own goals and recognize their specific needs. Moreover, no collaborative process can sustain without rigorous evaluation. A structured and on-going evaluation process can illuminate key factors of success and failure, creating a path to move the collaboration forward. While the process of collaboration can be daunting, rural communities should feel optimistic in these endeavors. Given the strong sense of place and deep-rooted social networks, rural communities are uniquely equipped to capitalize on the benefits of the collaboration. Bodin, Ö., and B. I. Crona. 2009. The role of social networks in natural resource governance: What relational patterns make a difference? Global Environmental Change, 19(3), 366-374. Caffyn, A. 2000. Is there a tourism partnership life cycle? In B. Bramwell & B. Lane (Eds. ), Tourism Collaboration and Partnerships: Politics, Practice and Sustainability (pp. 200-229). Clevedon, UK: Channel View Publications, Clevedon Hall. Dow, K., B. K. Haywood, N. P. Kettle, and K. Lackstrom. 2013. The role of ad hoc networks in supporting climate change adaptation: A case study from the Southeastern United States. Regional Environmental Change, 13(6), 1235-1244. Johnston, K. 2015. Public governance: the government of non-state actors in “partnerships.” Public Money and Management, 35(1), 15–22. Lasker, R. D., E. S. Weiss, and R. Miller, R. 2001. Partnership synergy: A practical framework for studying and strengthening the collaborative advantage. Milbank Quarterly, 79(2), 179-205. Manzo, L. C., and D. D. Perkins. 2006. Finding common ground: The importance of place attachment to community participation and planning. Journal of Planning Literature, 20(4), 335-350. Marquart‐Pyatt, S. T., and P. Petrzelka. 2008. Trust, the democratic process, and involvement in a rural community. Rural Sociology, 73(2), 250-274. McGehee, N. G., C. Kline, and W. Knollenberg. 2014. Social movements and tourism-related local action. Annals of Tourism Research, 48, 140-155. Mikalsen, K. H., and S. Jentoft. 2001. From user-groups to stakeholders? The public interest in fisheries management. Marine Policy, 25(4), 281-292. Mountjoy, N. J., E. Seekamp, M. A. Davenport., and M. Whiles. 2013. The best laid plans: Community based natural resource management (CBNRM) group capacity and planning success. Environmental Management 52(6), 1547-1561. Peroff, D. M., G. G. Deason, E. Seekamp, and J. Iyengar. 2017. Integrating frameworks for evaluating tourism partnerships: An exploration of success within the life cycle of a collaborative ecotourism development effort. Journal of Outdoor Recreation and Tourism, 17, 100-111. Plummer, R., D. Telfer, and A. Hashimoto. 2006. The rise and fall of the Waterloo-Wellington Ale Trail: A study of collaboration within the tourism industry. Current Issues in Tourism, 9(3), 191-205. Ramirez, R. 1999. Stakeholder analysis and conflict management. In D. Buckles (Ed. ), Cultivating Peace: Conflict and Collaboration in Natural Resource Management (pp. 101-126). Ottawa, ON, Canada: International Development Research Centre. Rogers, E. 2003. Diffusion of Innovation. New York City: Simon and Schuster. Sandstrom, A., and L. Carlsson. 2008. The performance of policy networks: the relation between network structure and network performance. Policy Studies Journal, 36(4), 497-524. Saxena, G. 2005. Relationships, networks and the learning regions: Case evidence from the Peak District National Park. Tourism Management, 26(2), 277-289. Selin, S., and D. Chavez. 1995. Developing a collaborative model for environmental planning and management. Environmental Management, 19(2), 189-195. Wondolleck, J. M., and S. L. Yaffee. 2000. Making Collaboration Work: Lessons from Innovation in Natural Resource Management. Washington, DC: Island Press.